Curly or wavy, singlecoated, low-shedding. The Portuguese Water Dog is a spirited working dog that loves to be in the water. Being that it was originally bred to assist fishermen at sea, the "Portie" as it is affectionately known, is an excellent swimmer and retriever. This breed made headlines in recent years as the First Dogs, Bo and Sunny, are both Portuguese Water Dogs. Porties are often confused with a similar breed, the Poodle, and like to stay active and show affection. They are loving, loyal and dependable, and make great family pets. The Obama's family dog, Bo, is a Portuguese Water Dog. The breed gained popularity after the Obama family brought him home to the White House in 2009. Portuguese Water Dogs were bred to be retrieving waterdogs for Portuguese fishermen. 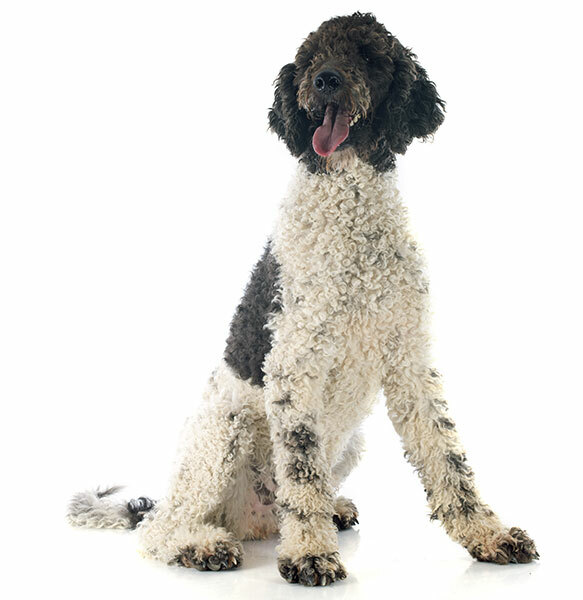 The breed likely shares an ancestor with the Poodle, a waterdog bred in Germany.